Hillary and Trump are nothing but two sides of the same white supremacist coin. 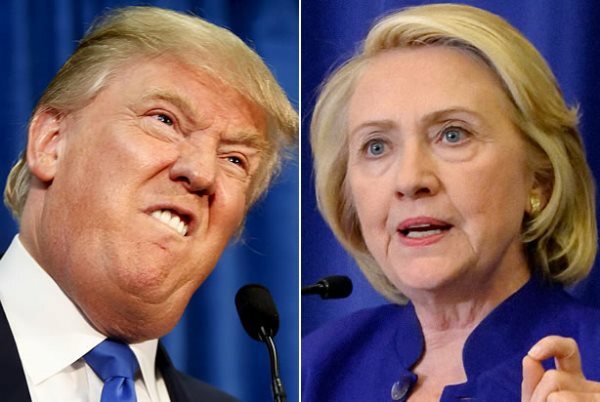 AFRICANGLOBE – Returning to the United States in an election year, I am struck by the silence. I have covered four presidential campaigns, starting with 1968; I was with Robert Kennedy when he was shot and I saw his assassin, preparing to kill him. It was a baptism in the American way, along with the salivating violence of the Chicago police at the Democratic Party’s rigged convention. “We lost 58 000 young soldiers in Vietnam, and they died defending your freedom. Now don’t you forget it.” So said a National Parks Service guide as I filmed last week at the Lincoln Memorial in Washington. The millions of Vietnamese who died and were maimed and poisoned and dispossessed by the American invasion have no historical place in young minds, not to mention the estimated 60 000 veterans who took their own lives. A few years ago, I attended a popular exhibition called “The Price of Freedom” at the venerable Smithsonian Institution in Washington. The lines of ordinary people, mostly children shuffling through a Santa’s grotto of revisionism, were dispensed a variety of lies: the atomic bombing of Hiroshima and Nagasaki saved “a million lives”; Iraq was “liberated [by] air strikes of unprecedented precision”. The 2016 election campaign is remarkable not only for the rise of Donald Trump and Bernie Sanders but also for the resilience of an enduring silence about a murderous self-bestowed divinity. A third of the members of the United Nations have felt Washington’s boot, overturning governments, subverting democracy, imposing blockades and boycotts. Most of the presidents responsible have been liberal — Truman, Kennedy, Johnson, Carter, Clinton, Obama. The breathtaking record of perfidy is so mutated in the public mind, wrote the late Harold Pinter, that it “never happened . . . Nothing ever happened. Even while it was happening it wasn’t happening. It didn’t matter. It was of no interest. It didn’t matter . . . . “. Take Obama. As he prepares to leave office, the fawning has begun all over again. He is “cool”. One of the more violent presidents, Obama gave full reign to the Pentagon war-making apparatus of his discredited predecessor. He prosecuted more whistleblowers — truth-tellers — than any president. He pronounced Bradley Manning guilty before he was tried. Today, Obama runs an unprecedented worldwide campaign of terrorism and murder by drone. On Obama’s watch, a second cold war is under way. The Russian president is a pantomime villain; the Chinese are not yet back to their sinister pig-tailed caricature — when all Chinese were banned from the United States — but the media warriors are working on it. It was through Ukraine – literally, borderland — that Hitler’s Nazis invaded the Soviet Union, which lost 27 million people. This epic catastrophe remains a presence in Russia. Clinton’s presidential campaign has received money from all but one of the world’s ten biggest arms companies. No other candidate comes close. The hysteria in the liberal media over Trump serves an illusion of “free and open debate” and “democracy at work”. His views on immigrants and Muslims are grotesque, yet the deporter-in-chief of vulnerable people from America is not Trump but Obama, whose betrayal of Black people is his legacy: such as the warehousing of a mostly Black prison population, now more numerous than Stalin’s gulag. The equivalent in the US are the politically correct warmongers on the New York Times, the Washington Post and network TV who dominate political debate. I watched a furious debate on CNN about Trump’s infidelities. It was clear, they said, a man like that could not be trusted in the White House. No issues were raised. Nothing on the 80 percent of Americans whose income has collapsed to 1970s levels. Nothing on the drift to war. The received wisdom seems to be “hold your nose” and vote for Clinton: anyone but Trump. That way, you stop the monster and preserve a system gagging for another war.